Andrew Goldwater represents investment funds, financial services companies, and groups of investors in commercial and securities litigation and arbitration involving complex financial products. He regularly represents buyers and sellers of distressed debt, currencies, and derivatives and other securities in connection with a variety of disputes involving failed trades, credit agreement and trust indenture issues, and contract and other commercial disputes. 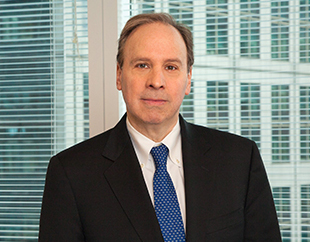 His practice also includes representation of bankruptcy estates, committees, and litigation trusts in bankruptcy litigation, including substantial fraudulent conveyance and avoidance claims. Representation of Sony Electronics Inc. in defense against $200 million in claims by the trustee of the Circuit City Liquidating Trust alleging preferential transfer, breach of contract, unjust enrichment, and other claims. Successful representation of a boutique investment bank before FINRA in defense of claims seeking to hold the firm’s client, as broker, liable for a trade of distressed debt which failed to settle. Following a five-day hearing, the panel issued a judgment in favor of our client dismissing all claims in their entirety. Representation of a telecommunications investment firm defending lawsuits alleging breach of fiduciary duty arising out of the sale of its interest in Clearwire Corporation, a publicly held company, to Sprint for approximately $100 million. Representation of a litigation trust formed in the bankruptcy case of Marvel Entertainment Group in the prosecution of claims for breach of fiduciary duty against Marvel's former controlling shareholder and affiliated directors in federal court in Delaware as well as on successful appeal before the Third Circuit. Successful representation of funds advised by a well-known asset manager in a series of lawsuits against major broker dealers related to their failure to deliver Venezuelan Oil Obligations in connection with trades of Venezuelan Brady Bonds. Representation of a telecommunications provider in an arbitration arising out of the post-closing adjustment process in connection with the sale of a subsidiary. Representation of a Japanese bank in the prosecution of claims against an Icelandic bank arising out of an unsettled foreign currency swap. Mr. Goldwater is a member of the New York City Bar Association and has served on its Committees on Government Ethics, Federal Courts, Federal Legislation, and State Legislation. He is also a member of the Federal Bar Council and its Securities Litigation Committee, and the American Bar Association Section of Litigation.